500,000 VND, 200,000 VND, 100,000 VND, 50,000 VND, 20,000 VND, 10,000 VND, 5,000 VND, 2,000 VND, 1,000 VND, 500 VND, 200 VND and 100 VND. 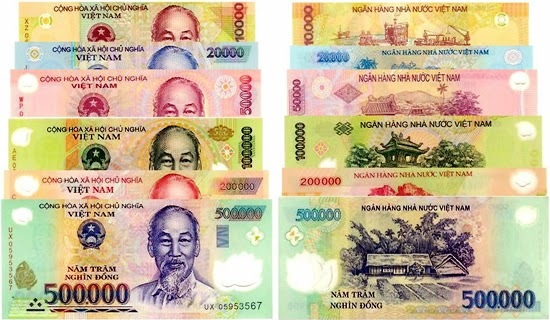 Vietnam Coins have 5 denominations: 5,000 VND, 2,000 VND, 1,000 VND, 500 VND and 200 VND. On 3 February 2009, the đồng had this title again as the Zimbabwean dollar re-denominated, although in March 2009 the title was briefly held by the São Tomé and Príncipe dobra. Since Zimbabwe abandoned its dollar on 12 April 2009, the Vietnamese đồng has been the least valued currency. 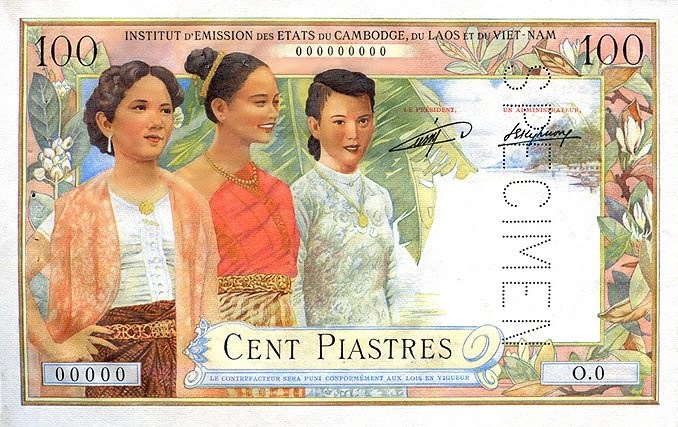 In 1946, the Viet Minh government (later to become the government of North Vietnam) introduced its own currency, the đồng, to replace the French Indochinese piastre at par. Two revaluations followed, in 1951 and 1958; the first was at a rate of 100:1, the second at a rate of 1000:1. Notes dually denominated in piastres and đồng were issued in 1953 for the State of Vietnam, which evolved into South Vietnam in 1954. On September 22, 1975, after the fall of Saigon, the currency in South Vietnam was changed to a "liberation đồng" worth 500 old Southern đồng.